The Ph.DMV Test Prep App offers a fresh take on how teens should study for their permit test. Instead of providing the standard set of multiple choice exam questions that teens have come to expect from all online drivers ed study tools, the folks at Ph.DMV serve up a two-pronged study approach: work-hard and play-hard. Yes, teens still get access to free DMV practice tests; after all, simulating true DMV test situations is key when prepping for the real deal. But Ph.DMV doesn't stop there. Enter Hangdummy - PhDMV's brilliant drivers ed test prep reinforcement tool. Playing Hangdummy is so fun that teens might forget that they are still preparing for the DMV permit test. Looking for quality and quantity when it comes to DMV test questions? Drivers Ed Direct has a simple yet effective permit test prep application to help future drivers get ready for the permit test. Pros: The large pool of practice test questions guarantees that students will get their money's worth. In addition, there is no limit to the amount of practice tests students can take once they purchase the app. 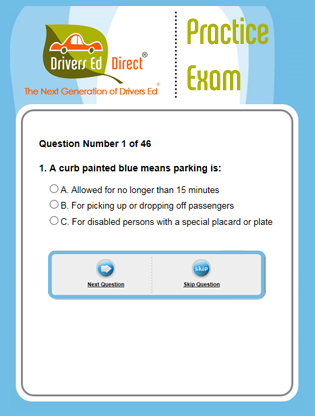 Test questions are pulled directly from real DMV permit exam questions. It's no secret to teens everywhere -- learning to park a car can be one of the trickier hurdles leaped on the DMV drive test. 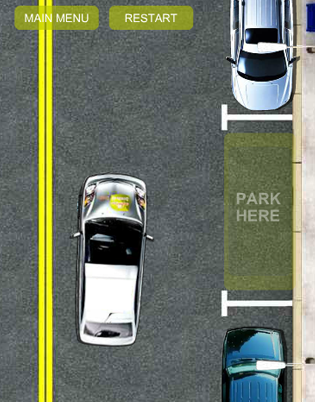 Rarely do we find a game that actually aids in the development of parking skills, but this flash game is an exception to the rule. What we like: This game does a great job of simulating the angles of approach and wheel maneuvering needed when parallel parking a real vehicle. What we really like: it won't cost you $1000 and a panic attack when you bang into a parked car. If learning online is your thing, then you'll love what Drivers Ed Direct has for you: a 100% online drivers ed course that is approved by the state of California DMV. What's it like taking drivers ed online? It's like taking drivers ed in a class, but you go at your own pace and get to skip the crowded drivers ed classroom; not to mention you don't have to listen to 30 hours of boring lectures and watch 40-year-old videos... NICE! Traditionally, the best drivers ed apps have three things in common: they are cheap to own, have high ratings, and offer a positive user experience. The best Drivers Education Apps available today are usually offered free up-front with the ability to make in-app purchases after you have "taste-tested" the service. Passing the DMV exam is not as intimidating if you know what to expect. Preparation is important and includes getting your mind and body prepared for a few hours at the DMV. Seems like everybody around you is getting behind the wheel, so why do you feel like you're still in the backseat when it comes to earning your learner's permit? Is Your App Idea The Best Yet? 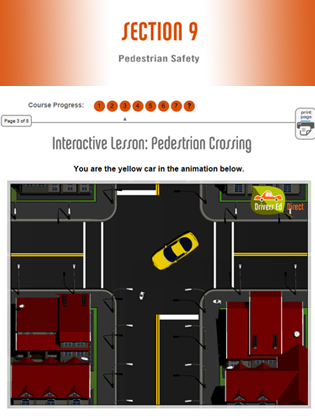 So, you think you can design the best Drivers Ed App ever made? Do you know what the "next big thing" will be for teen drivers? We want to hear your idea! Did you know that there are over 1.2 million Apps available in the App store? No wonder it is such a pain in the rear-fender to find a good one.